A veneer is a thin covering over the enamel of a tooth. 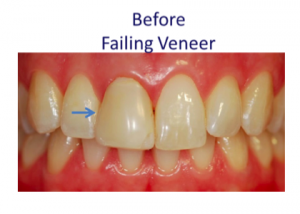 In order for the veneer to bond correctly, it needs to be bonded to the enamel of the tooth rather the dentin. They are fabricated from a composite resin, or, in ideal circumstances, from porcelain. If the underlying color of the tooth becomes darker, the veneer can no longer used, because it cannot make over that color. 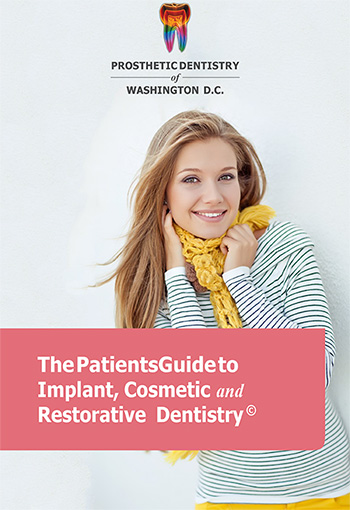 Once this happens, the veneer has to be replaced with a full coverage crown that blocks the dark coloration and allows the incorporation of the right amount of translucency and internal coloration to match to the adjacent tooth. This is a very difficult process, when restoring the maxillary central incisor, because it is on the midline of the jaw and face. The replacement crown was fabricated on a tooth colored zirconia copings, which was milled to fit tooth abutments with the crown anatomy then being custom fabricated by our in-house technician. This provided the natural aesthetics presented here. 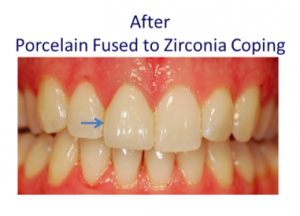 The natural colored substructure zirconia coping was used to make it blend better with the adjacent maxillary central incisor and create a more natural looking crown.